Whether you are looking for a functional sword or a decorative katana to showcase in your home, the Golden Flower Red Wrap Katana makes an excellent choice. 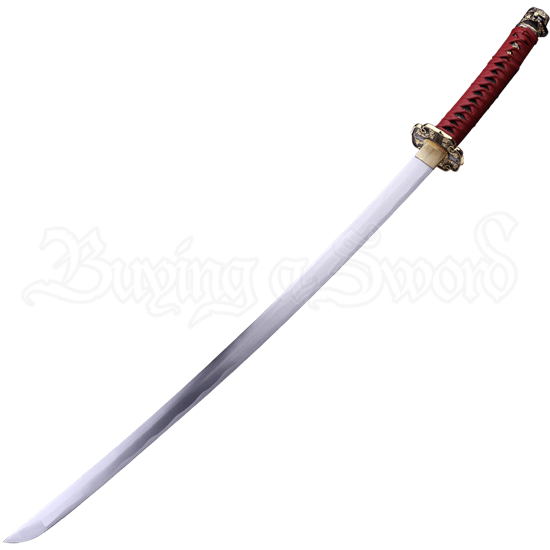 This ornate katana features elegant detailing and a carbon steel blade. The black imitation ray skin handle is wrapped with red cord, and the tsuba, end cap, and fittings are all made from a zinc alloy. Golden floral detailing decorates the tsuba, end cap, and scabbard. The golden sheen looks striking against the black and red coloration of the oriental sword. This is a top notch Japanese sword for a great price, making it the perfect choice for anyone wanting to expand their collection!